Quality aluminium finishing is a choice, not chance. Experience hassle-free service with our aluminium finishing lines. Make the choice to have aiFAB manage your finishing requirements, and we’ll make it easier to deliver the superior results your customers expect from you. 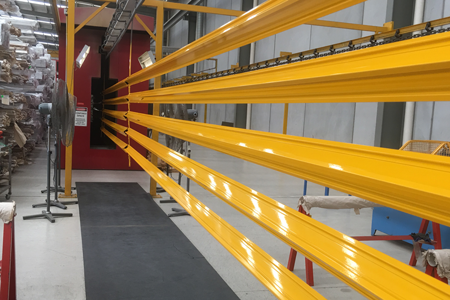 With multiple on-site powder coating and anodising lines, we are nimble and responsive in a way that large-scale finishers cannot be. Especially suited to large, custom, or late-notice projects. AiFAB maintains an award winning powder coat line that provides high-quality aluminium finishing for projects. 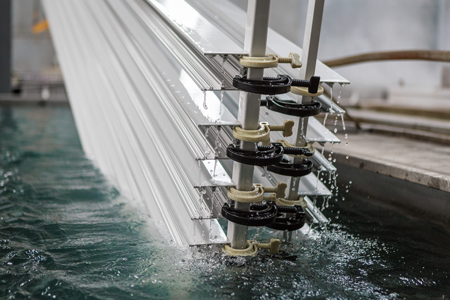 Exclusively available to customers of Aluminium Industries, aiPC is flexible and delivers quality jobs. We use the latest technology and follow strict procedures to deliver finishes with outstanding results. Our process follows all controlled procedures required to apply warranted powder from Interpon and Dulux. With multiple jobs and varying colours each day, efficiency keeps us nimble for tight timelines. The work of aiPC can be seen in some of Australia’s most innovative and iconic projects. View our powder coat selection guide here. With three anodising lines on site, we take care of our customers’ anodising needs. This keeps us responsive for large, custom or short-notice projects, ensuring reliable delivery dates and a stable supply chain. The aiFAB team will manage the logistics of surface finishing for the extrusions we supply you. Your order will simply arrive on time, with a great-looking finish. View our anodising selection guide here. Get in touch about your project’s finishing requirements today.